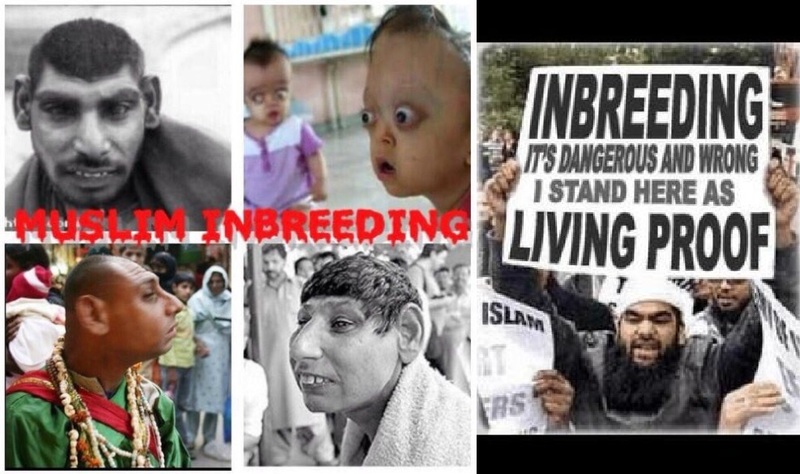 Islam Inbreeding, IQ and Aggression – Zeepertje.com – Facts Fun & News on ISLAM, "The religion of peace"
The Islamic Republic of Pakistan is almost completely Muslim – about 97 percent. Today 70 percent of Pakistanis are inbred. Turkey is something like 99.8 percent Muslim (and those .2 infidels are constantly being persecuted by the way). In Turkey (closer to Europe, more Westernized) the amount is between 25 to 30 percent inbred. Roughly half of everyone in the Arab world is inbred. Did I mention that Pakistan, the country that hid Osama bin Laden, have nukes? Yeah, those inbreds have nukes. Among the many birth defects that are the result of inbreeding are lower levels of IQ and higher levels of aggression. Yikes. That might explain the correlation for support for the brutal Islamic Law called “Sharia” and just how long a region has been Islamic. And then of course now Islamic inbreeding is being exported to the West. A BBC investigation recently revealed that at least 55 percent of the Pakistani population there (Muslim by the way) was married to a first cousin. I think I need to drink something carbonated. My stomach feels sick. Okay, I’m back. I just had to throw up. It’s always better if you just give in to it, rather than fight it. I feel a whole lot better. Where was I? Oh yeah, Islamic inbreeding. Ew. Anyway, The Times of India affirmed that “this is thought to be linked to the probability that a British Pakistani family is at least 13 times more likely than the general population to have children with recessive genetic disorders”. Right. Like lower levels of IQ and higher levels of aggression. The BBC’s research… let me stop right here. Usually the BBC goes out of their way to avoid saying anything that could even remotely offend Muslims or even suggest there is a Muslim problem in Europe, so this must be something they just can no longer deny. Anyway, the BBC discovered that while UK Pakistanis account for about 3.4% of all births in Britain, they account for 30 percent of all British children with disorders that are the result of inbreeding. That and a higher rate of infant mortality. In the UK a Labour Party MP called for a ban on first-cousin marriage. How Islamophobic of him, really. They are an enemy of all people. An enemy of civilised people. An enemy of nature. The Bible has a lot of predictions about the devil and demons.. It just happens now, you have to look around and you’ll know the truth.